Desiderius Erasmus Roterodamus (1466-1536 C.E.) is the first change agent under review. Born in the Netherlands towards the latter half of the fifteenth century, Erasmus was a Roman Catholic priest and Augustinian monk who was not content to live life inside the monastery walls. Rather, his desire to ask questions and learn about the broader world pushed him to travel all over Europe, meeting new people and encountering new ideas. Early on in his career Erasmus collected and subsequently published a book of sayings and phrases “culled from antiquity” which not only broadened his perspective of life but helped broaden the perspective of those around him. In summary, Erasmus was a change agent who placed a high value on asking questions rather than being content with prescribed answers. In helping others navigate the changing cultural landscape, he acted with wisdom, humility, and humor, rather than seeking rather than seeking to build himself up with pride and knowledge. Throughout his life, Erasmus refused to rely solely on his intelligence; rather he constantly sought to develop his personal character by placing “ethics and spirituality at the center of [his] theology and philosophy with Christ’s teaching as the model for fruitful Christian reflection.” All of this led to a broad perspective of life with friends and admirers on both sides of the primary cultural and religious divide of his time, that of the Protestant Reformation. The second change agent under review is Martin Luther (1483-1546 C.E. ), the leader of the Protestant Reformation. Like Erasmus, Luther was an Augustinian monk and priest within the Roman Catholic Church. He also placed a high regard on questions, wisdom, character, and a broad perspective of life, though his personal journey with these values took him in a different direction than Erasmus. For Luther, his desire to better understand the Way of Christ led him to reject the answers traditionally given by the leadership of the Roman Catholic Church. The end result of Luther’s questions was the posting of the famous Ninety-five Theses in Wittenberg on October 31, 1517 which led to the Protestant Reformation. Throughout his life, Martin Luther engaged in an introspective journey to know and understand himself. Despite his fame as an international religious leader, Luther “never gave off the aura of a medieval saint”; rather, he would “realistically evaluate his strengths and weaknesses” while publicly confessing his personal flaws. Luther’s focus on truly knowing himself led to his theological masterpiece, mainly that salvation is a “free gift of divine mercy for which the human person can do nothing.” This conclusion was in direct opposition to the predominant view that salvation could be bought and sold by the Roman Catholic Church by drawing on the “merits of Christ – and of his saints.” In challenging this perspective of salvation, Luther became a major change agent who helped bring correction to the wider church of his day. As a change agent, Martin Luther was one who was not afraid to pursue questions despite the uncertainty of where they might lead. He also demonstrated wisdom in knowing how to navigate the politically charged landscape of his day. Luther’s deep moral conviction was, as previously mentioned, a major bulwark against the pressures of fame, prescribed answers, and the narrow-mindedness of those in leadership roles above and around him. All in all, Luther was able not only to broaden his own perspectives of life, but those of others across Europe and, eventually, the world. Even though he was famous during his lifetime, Michelangelo “cared not a whit for riches, nor even for food or clothing.” Rather, he maintained a humble lifestyle, seeking to devote all his energy and focus to crafting works of art. Michelangelo’s desire to create items of beauty was constantly challenged by the political upheaval within the courts of Pope Julius II, his primary benefactor. The wisdom he showed in navigating the treacherous waters of artistic rivalry, political backstabbing, and full-out national war is commendable. 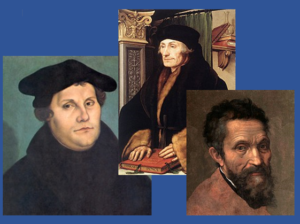 Erasmus, Martin Luther, and Michelangelo all possessed the rare ability to tap into the emotions of their time and help people navigate the changing cultural landscape. Though their personalities and beliefs differed, they all valued the act of asking questions, seeking wisdom, being true to one’s personal character, and having a broad perspective of life over and above preset answers, factual knowledge, personal intelligence, and narrow-mindedness. In doing so, they changed the course of their culture and, ultimately, the world. Thomas Cahill, Heretics and Heroes: How Renaissance Artists and Reformation Priests Created Our World (New York City: Nan A. Talese / Doubleday, 2013), 135. Thomas Cahill, Heretics and Heroes, 132-133. Justo L. González, The Story of Christianity: The Early Church to the Present Day, vol. 2, The Reformation to the Present Day (Peabody, Massachusetts: Prince Press, 2009), 11. Thomas Cahill, Heretics and Heroes, 136. Roger E. Olson, The Story of Christian Theology: Twenty Centuries of Tradition and Reform (Downers Grove, Illinois: InterVarsity Press, 1999), 315. Justo L. González, The Story of Christianity, 13. Thomas Cahill, Heretics and Heroes, 155-157. Justo L. González, The Story of Christianity, 22. Thomas Cahill, Heretics and Heroes, 164. Roger E. Olson, The Story of Christian Theology, 380. Thomas Cahill, Heretics and Heroes, 151. Ross King, Michelangelo & the Pope’s Ceiling (New York: Walker & Company, 2003), 313. Ross King, Michelangelo & the Pope’s Ceiling, 312. Thomas Cahill, Heretics and Heroes, 109. Ross King, Michelangelo & the Pope’s Ceiling, 299. Ian Morgan Cron, Chasing Francis: A Pilgrim’s Tale (Grand Rapids, Michigan: Zondervan, 2013), 110. Ross King, Michelangelo & the Pope’s Ceiling, 313.